On laptops or desktops, visit our downloads site from the device you wish to protect. On Android phones and tablets, download Prey from Google Play. On iOS phones and tablets, download Prey from AppStore. If you need to deploy Prey massively, visit the Unattended Install guide for Computers, and the Mass Deployment guide for Android and iOS. 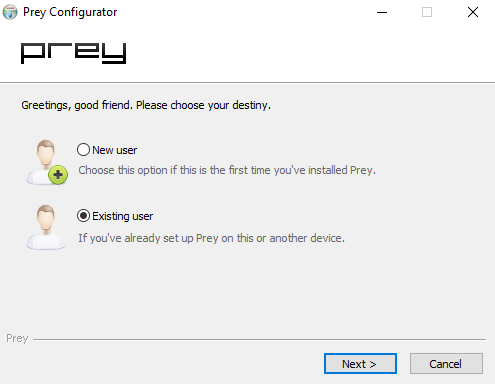 Once you downloaded and installed Prey on your device, you need to enter your account credentials. On mobile devices you will need to run the app for this, while on computers, the configuration window will open automatically at the end of the installation. It will look something like this. Remember that if you still don't have an account, you can register on the same window or here. Once the process is finished, you will be able to see your device on your Prey account. In case you don't remember your password, you can always request a new one. Keep in mind that free accounts can protect up to three devices. If you reached your maximum capacity you will need to delete an old one or become Pro.